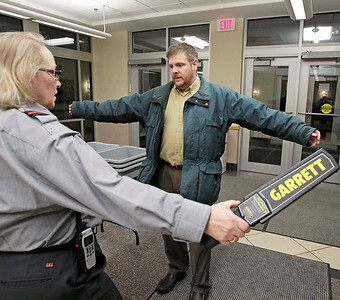 Matthew Apgar - mapgar@shawmedia.com Security guard Denice Moesch with Securitas, left, instructs McHenry County Information Technology Department web manager Greg Schoen to spread his arms for a handheld metal detecting wand upon entry to the McHenry County Administration Building for a county board meeting on Tuesday, Feb. 16, 2016 in Woodstock. The security guards will be using the wands until full metal detecting units are installed. Matthew Apgar - mapgar@shawmedia.com Security guards with Securitas use a handheld metal detecting wand upon entry to the McHenry County Administration Building for a county board meeting on Tuesday, Feb. 16, 2016 in Woodstock. The security guards will be using the wands until full metal detecting units are installed. 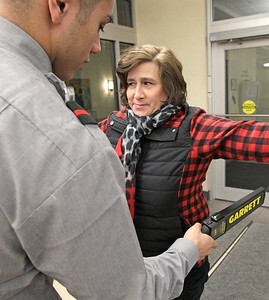 Matthew Apgar - mapgar@shawmedia.com Security guard Urbano Perez with Securitas, left, uses a handheld metal detecting wand on Dianne Diana of the Pioneer Center upon entry to the McHenry County Administration Building for a county board meeting on Tuesday, Feb. 16, 2016 in Woodstock. The security guards will be using the wands until full metal detecting units are installed. 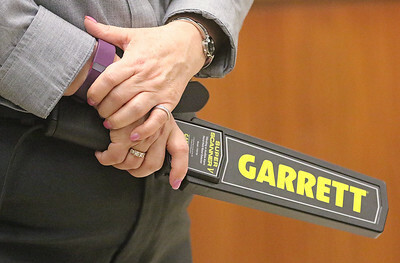 Security guards with Securitas use a handheld metal detecting wand upon entry to the McHenry County Administration Building for a county board meeting on Tuesday, Feb. 16, 2016 in Woodstock. 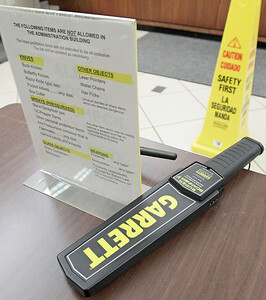 The security guards will be using the wands until full metal detecting units are installed.